An economics mission based on a fictional, out of the way, Irish village. A text file in the download has the story and development details. Thanks for downloading, it is my first map. This map will not present any challenge for the majority of players. the Victory conditions are too easily obtainable. The availability of the market with nearly all the resource options is a glaring fault that makes the game too easy to complete. The Victory conditions are to be completed within 14 years, yet, on Normal setting, it can be completed in 4 years. The game was too easy,a rating of Very Easy would have suited it better. Vast resources easily available,nearly all required buildings pre-positioned,as well as plenty of flat grassland for further expansion, all combine for a very easy victory. A scenario where you have to obtain resources is the basis of any economic game,this is where this game falls short. To many resources are made available either on the map or unintentionally via the market. The basis of the game is a good one and I so wanted it to live up to it's storyline. The map is quite large, yet most of the action takes place around the Keep. the map has a few heights here or there but is mostly flat grassland apart from a lake. 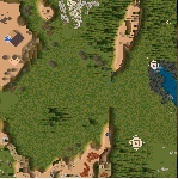 the map is very blocky and more use of the terrain tools needs to be incorporated, hills need to be sculptured better instead of jutting out of the ground for no apparent reason The area around the Keep shows that the author does have a fair knowledge of landscaping. The best feature of this game is the storyline.It is well written and sets the game up nicely for the player. This could have been so much better, the author claims he worked on this for a year, off and on. In that time the landscape could have been improved,and the game play tested for faults or shortcuts. The author delivered a good premise of an idea,and with a few easy refinements with the editor tools and reduced market resource availability, the game would be vastly improved and make for a better game and review score.